Klaus Caprani's instruments. The acoustic page. Chromatic scale with 6 chord groups. Hoyer 12-string acoustic. Built l.'50 - e. '60. Notes: Got this splendid vintage 12-string very cheap as garage sale. and brilliant. What more could you ask for ? the Maya still sounds good. Santana model A-680 dreadnought. Built approx. '70. Notes: This guitar has been in my ownership since early elementary school. A great acoustic guitar with a big sound and quite easy playable neck. This guitar is an early issue of this model (serial no. 199). Peavey "Indianola" electro/acoustic dreadnought with piezo-ceramic pick-up system and onboard equalizer/Pre-amp. Built '99. Pick-up: Fishman piezo/ceramic system with onboard vol.+ 3-band EQ. Notes: I purchased this guitar late 1999. Related to the price it's no less than fantastic. I bought it at Woodsound in Copenhagen for some unplugged gigs, and I'm very satisfied. In opposition to many other electro/acoustics this guitar is quite insensitive to feedback which makes it easy to handle in a live situation. Very slim and easy playable neck. I've been playing Fender and Takamine electro/acoustics appearing to be lower quality than this. Not bad for a guitar priced approx. 3000 kr/375$ - one of the best hard-cases I've seen, included! Danish handbuild acoustic guitar. Brand unknown. Built approx. mid '50'es. Notes:This guitar is a heirloom and sat for several years on the wall being unplayable, as I didn't want to touch the originality of the instrument in any way. I finally reached the conclusion that it was a pity to just having it there on the wall if it could actually be used, and so I had the idea to string it up very lightly and tune it down to D, not to stress the neck too much (it has no thruss-rod). Now it's fantastic to record it on top of a guitar in std. tuning, and the tiny New Yorker body sounds incredibly crisp. 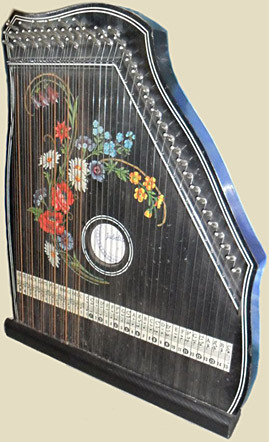 Several repairs where the binding on the neck had come loose and the top had cracked had to be performed. Arcus mandolin. Vintage unknown. Repaired and set up by myself (new frets, laquer and more). Notes: This mandolin actually had a hole in the top (presumeably worn by a pick), which I managed to fill and cover up quite successfully. Bridge: Ebony with bone inlay. 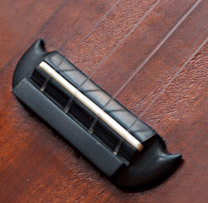 Closeup of the bridge I built for the old Uke. Notes: As this instrument is one I found thrown away, I'm not sure which kinds of wood were used for manufacturing it. The neck is definetely mahogany, but sides, back and top are open mysteries. Through my own investigations I came to the result that it's likely to be two subspecies of indian rosewood but I'm by no means sure about that. Framus "ragtime guitar". Vintage unknown. Neck and body are separated (has to be glued). Tuners and frets need repairs. These guitars are said to record great. 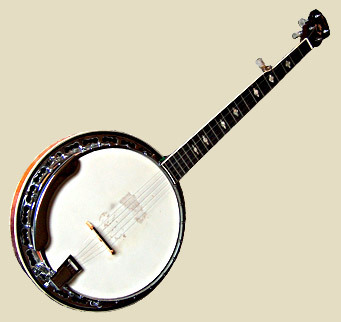 I'm thinking about tuning this one in Nashville tuning/High strung = the 4 lowest strings, 1 octave above standard tuning. This gives a very bright sound which is fantastic, especially together with another guitar in standard tuning. Different parts are missing such as a couple of the tuners, a couple of strings and the bridge. This one is the type with the resonance hole in the end of the body.